Buyers Products SaltDogg Electric Under Tailgate Spreader is an ideal choice for trucks that are not equipped with a central hydraulic system. It gives contractors and municipalities an under tailgate spreader that can spread bulk salt and salt/sand mixes. The spreader works with 96 in. wide dump bodies. A SaltDogg Electric Under Tailgate Spreader is built to last. The spreader is constructed 10 Ga 304 stainless steel construction for the ultimate in durability and corrosion resistance. The spreader features an anti-flow plate and 3/16 in. thick endplates. A three-point hinged bottom cover allows easy access to the entire auger assembly and hassle-free cleanout. It's equipped with a 6 in. auger with 3/8 in. flighting and comes with an auger screen. This under tailgate spreader gets the job done. It's powered by two independent 12V direct drive motors: a 3/4 HP gear motor for the auger, and 1/2 HP motor for the spinner. The spreader also features a sealed, self-aligning 1-1/4 in. diameter bearings with grease fittings. The spreader is controlled by a heavy duty, in-cab controller with independent variable speeds for the conveyor and spinner, and the 14 in. poly spinner can cast material up to 25 ft. The spreader is available with standard or center discharge. Buyers Products offers additional options, including a stainless steel spill shield kit. Side Plate Height: 8.00 in. Overall Width (at top): 96.00 in. 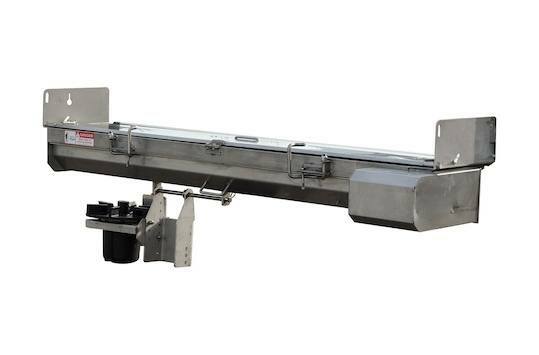 Spreading Width Range: 4 To 25 ft.
Works with 96 in. wide dump bodies. Rugged 6 in. auger with 3/8 in. flighting. 12V DC-powered electric drive with independent conveyor and spinner motors. 14 in. poly spinner can cast material up to 25 ft. Available with center or standard discharge. High quality 304 stainless steel construction. Optional stainless steel spill shields.